If you’re considering an upgrade for the tires on your vehicle, but you’re not certain about the best tire type, we have the ultimate guide to aid you in finding the right tire for your vehicle, your driving style, and the conditions in which you most often drive. The most common tires that we replace/upgrade are standard tires, performance tires, all-terrain tires, snow tires, and all-weather or all-season tires. If you don’t know the difference between these tire types, or you’d like to weight the pros and cons of each type of tire, then continue reading to learn the specs you need to know about your upcoming tires. And, if you’re ready to swap out your current treads for a new set, you can always stop by our Denver auto shop or schedule an appointment to check out our catalog of the latest and greatest tires on the market. Standard and stock tires are the tires that you’ll find on most vehicles that pull out of the dealership. These tires are designed for high longevity on the vehicle upon which they’re mounted — and there are really no frills beyond that. Let’s dig into the pros and cons of standard and stock tires. Standard/stock tires are the most affordable option, which is why they’re the most common choice for drivers out there on the road. These tires are designed to have a high tire life (often about 50,000 miles). If you’re looking for a tire that provides value, and you’re a fairly traditional commuter, then this is the best option for you. Standard/stock tires often aren’t the best in terms of performance, and how well they handle adverse road conditions, including heavy rain, snow, and off-road conditions. If you’re constantly traveling in difficult weather conditions, or you spend plenty of time on dirt roads, then you need to upgrade from the standard tire. Standard tires will wear out more quickly in these trying conditions, and they aren’t as safe to drive with, since you can easily lose traction in adverse conditions. Consider performance tires, all-weather tires, all-terrain tires, or snow tires — all of which you can learn more about below. Who should use these tires? If you simply use your vehicle to commute from point A to point B, then standard tires are probably sufficient. If you spend your time on smooth, paved roads, traveling at highway speeds at the most, then your car will perform just fine with a set of stock tires. That said, weather conditions can change on a dime here in Denver (where our auto shop is located), and it’s always a good idea to have snow tires, or at least all-weather tires for when the white stuff starts to stick to the road. Curious about the best tires for your make and model? We’ll connect you with a catalog, and we can help guide you to the right set of tires for your vehicle and preferences — just reach out to us or stop by the shop! Performance tires are just that: tires built to perform. If you’ve got a sports car or a suped up vehicle, then you may just want to put it on top of four performance tires, to ensure that you have the optimum grip on the road. Performance tires enhance the control of your vehicle at high speeds, through tight turns, and if you need to brake quickly. Consider investing in performance tires if you have a vehicle that you’d like to install performance upgrades under the hood. Performance tires are more expensive than standard tires, and they may be overkill if you aren’t pushing the performance of your vehicle. If you have a car with all stock components, then you probably don’t need performance tires. That said, some sports car or luxury sedan owners may benefit from the added control of performance tires, and they’ll enjoy the extra responsiveness that these tires provide. As we mentioned, performance tires are best utilized by those who push the performance of their vehicles. Consider performance tires if you’re constantly travelling at high speeds, stopping short, or taking turns aggressively. These tires aid aggressive drivers in maximizing the control of their vehicle, even under tire-squealing conditions — just be sure to stay safe out there if you’re pushing the limits of your vehicle. All-terrain tires are ideal for truck and car owners who take their vehicles off the pavement and out into the rougher stuff. All-terrain tires are pretty self-explanatory. These tires have treads that are designed to handle off-road driving, including dirt roads. Depending on the make of the tire, you’ll find that certain tires are designed for more extreme off-road use, others are designed for mud, and others are simply considered all-terrain. If you’re spending as much, or more time on dirt and rock than on pavement, then these are the tires for you. All-terrain tires don’t perform well on the road. You’ll wear through tread quickly if you’re spending time on the highway, and your tires won’t last long if you’re traveling at high speeds. Plus, all-terrain tires are more expensive than standard tires, so if you’re deciding on your next set of treads, it’s best to keep to standard tires if you’re planning on spending most of your time on pavement. All-terrain tires are ideal for those who travel off the beaten path. If you have an SUV that you like to keep at your mountain cabin, then all-terrain tires may be ideal for you. Or perhaps you have a truck that you keep at the ranch. Again, these tires will help you to conquer muddy, rocky roads, and those two-foot potholes. 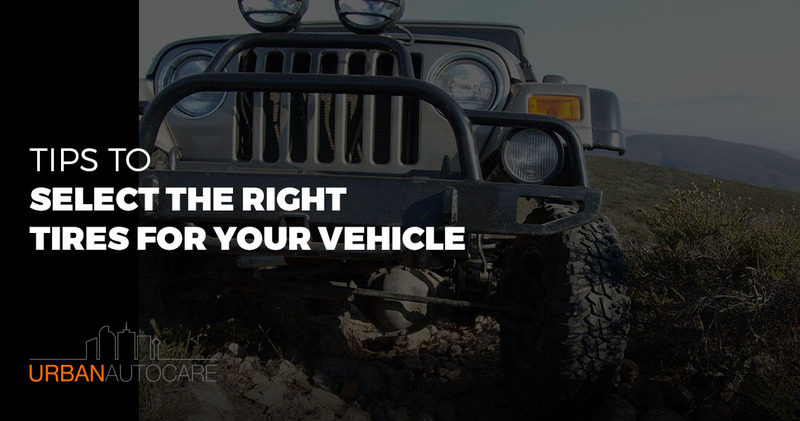 In general, all-terrain tires are most common on trucks, SUVs, and vehicles with high clearance. Snow tires are ideal for drivers who spend their winters along the front range. If you’re a snow bunny, you’ll need snow tires to get you to the mountains and back home safely. Snow tires give you traction, even in the most trying circumstances. When you’re skirting down a blizzardous I-70 this winter, you’ll remain comfortable knowing that your tires still have traction in the face of slush, ice, and drifting snow. Snow tires have treads that are designed to dig deep into snow, and they are often studded, ensuring that your tires dig into the icy surface below. These design features ensure that you get the best performance out of your vehicle, regardless of a few inches of snow on the road. You’ll have an easier time accelerating, stopping, turning, and recovering, should your vehicle break loose on the road — and that means a safer, more enjoyable ride throughout the winter. Like all-terrain tires, snow tires can wear down quickly if you’re driving on dry pavement. These tires are designed for snow, and they’ll wear out if you’re simply using them to get around. The treads will wear more quickly on paved roads, and studs can wear down especially fast if you’re taking your vehicle over dry tarmac. Often, drivers who opt to purchase snow tires keep an additional set, and they’ll swap between sets to account for current road conditions. If you’re spending significant time on snowy roads, then snow tires are for you. Snow tires can be outfitted on any vehicle make and model to help drivers conquer snowy conditions that may otherwise be challenging or dangerous. If you live in the mountains, or you’re constantly heading to the slopes in the winter, then it’s wise to invest in a set of snow tires to ensure that you stay safe on those windy roads. All-weather tires are designed for just that: any weather that Mother Nature can throw at your vehicle. Unlike snow tires, all-weather tires perform well in most conditions, from dry roads to mud to snow. All-weather tires are a worry-free solution for drivers that constantly travel in diverse weather conditions. These tires have treads that cut through water, grip dry pavement, and perform well with moderate amounts of snow. Plus, unlike snow tires, you won’t have to swap out your treads as the seasons change. All-weather tires are more expensive than standard tires, but they may be worth the cost. Also, all-weather tires shouldn’t be used in extreme conditions (off-roading, or heavy winter storms, for example). All-weather tires still don’t perform as well as all-terrain tires if you’re heading into the wilderness with your vehicle, and they can’t tackle extreme snow and ice conditions as well as a set of snow tires could. All-weather tires may be suitable for most drivers out there, especially drivers who live along the Front Range, where weather and road conditions can vary in a matter of hours. You should consider all-weather tires if you don’t want to worry about checking the weather report before taking to the road. You can rest assured that your vehicle will perform pretty well out there, regardless of the conditions. Ready to upgrade your tires? Or need an extra set to help you as you navigate mountain roads this winter? We can help. We carry a catalog of various tires, and we’d be happy to connect you with the perfect set for your driving style, as well as the model of your vehicle. Get in touch with us today to learn more, or to schedule an appointment!